Elpis Counselling – Experienced Mental Health Professional. Support in Hope and Growth. Most people at some point in their lives will struggle with the demands and complexities of the modern world. These struggles are often influenced and exacerbated by previous experiences or events which then effect the way we think and feel about ourselves, other people and the wider world. No two people experience things exactly the same way. Some people may become anxious or depressed when times are tough (or sometimes for no obvious reason at all) while others may find it difficult to control their anger, develop sleep problems, issues around eating/body image or find that bad memories from the past may be constantly popping up in their thoughts or dreams. Research shows that one in six people in the UK will experience some form of mental health issue during their lifetime (though I believe the actual figure is actually much higher than that). It is common for people to feel that they are weak or useless or failing in some way if they reach out and seek support for what they are going through. The British ‘stiff upper lip’ still exists and often people hold a belief that talking to someone about their thoughts and feelings is wrong and they should be able to ‘just deal with it’. The problem with this is that over time negative thoughts, feelings and experiences can build up to a point we cant push them down or away any more and we start to feel overwhelmed, stressed as well as emotionally, mentally and physically unwell. Therfore, if you are reading this and it is the first time you have thought about or looked for a counsellor or therapist then you have already done one of the most difficult parts of therapy. Realising that you need some support and being able to own what is happening to you and not ignoring it is often the most difficult step to take in the road to a happier and contented life. The road to understanding ourselves and why we think, feel and behave the way we do (even though it makes us feel bad) is often a very rocky and bumpy one. My experience tells me that those who are motivated and open to the prospect of change can get to a place where they are better able to make their way through this wonderfully strange, unpredictable, confusing and often scary world, with a better understanding of their place and the place of other people within it. 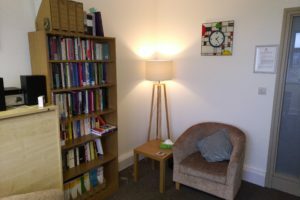 If you wish to find out more about counselling or psychotherapy please contact me and if you think it is for you, we can make an appointment that might help you change your life and lead you down a road of self discovery and clarity which will enable you to make the most of yourself and the people around you. I have used a lot of therapy rooms over the years, some have had hospital beds in them, some have have massage therapy tables in them, one had a full size plastic skeleton hanging in it! Most often they have kind of had a ‘Grandmother’s Parlour’ energy, lots of flowery things, gingham, pieces of wood hanging on the wall and trinkets lying around (often with positive affirmations on them, ‘I see the perfection in all my flaws and all my genius‘, that kind of thing). 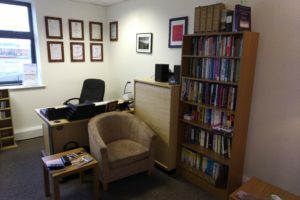 I moved into my office in August last year and it is still a work in progress, but it is taking shape. I am trying to make it a warm and comfortable space to be in. I am a bit of a book nerd and having the therapy and other books I have aquired over the years next to me as I work makes me happier than it possibly should, and they often help me during a session. 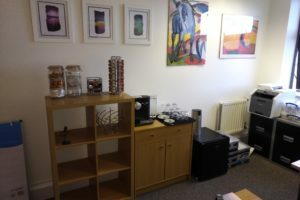 I believe that what I do is important, if you are considering contacting me and enquiring about therapy, then at some point you may be putting a very high level of trust in me and you need to feel safe and comfortable in your surroundings to do so, which is the reason I am showing you what my room looks like on the website. You can be expected to be offered a nice coffee and a biscotti on arrival (you will need to tell me if you take milk though as I rarely have it in the fridge), with the option of a herbal or mint tea, or just a bottle of water if you prefer. I can also guarantee that there are no positive affirmations in sight and there is nothing in there that will invite you to aim for the stars or similar. You will be offered a professional, objective, caring and supportive set of ears, and a space where you can work on yourself and your issues away from the distractions of everyday life.